Calculated by comparing U.S. E-Commerce Sales values to the year before. 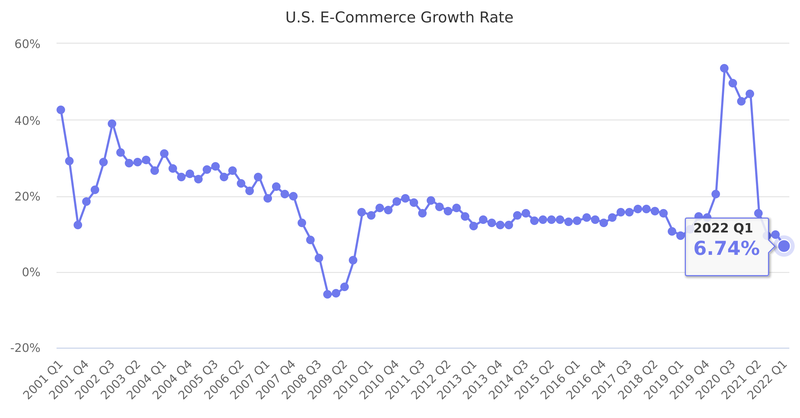 2008-2009 were challenging years for online retailers. The financial market meltdown that began in the fall 2008 dramatically reduced consumers’ discretionary spending power, resulting in the first quarter of negative growth. It took a year to restore to a growing online market. E-commerce sales reached $394.86 billion in 2016, a 15.6% increase compared to $341.70 billion in 2015. Last reported quarter 2018 Q3 it was 14.3%, down by -2% year-over-year from 14.7%.